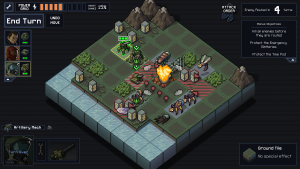 This title is a tactics game where the enemy is giant monsters and you control a squad of giant robots, tanks, mobile artillery and other weapons of mass kaiju destruction. And the goal is the protect the cities at all cost. The game seems to have a focus on environmental interaction, such as knocking enemies into buildings and mountains for extra damage, but also the mechanic that you can tell where the enemies will attack. And there is an element of time traveling, but it is not explained how it will work, i could be just a simple explanation of how the retries work in a narrative perspective.